If you're looking for a good introduction to the north part of Israel, look no further than the Classic Galilee and Golan Tour. The best tour guides in the country will show you the many exceptional sites that this diverse country has to offer. Explore the northern part of Israel in 3 days. Have an Autentic lunch at Druze village. Visit Safed a magical town in the north. Overnight in Kibbutz Hotel Galilee. 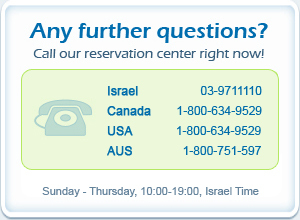 Pick up from Jerusalem or drop off in Tel Aviv is additional $75 per person (in double room) or $150 (single room).